I bought this book mainly because I loved the cover. Sad, I know, but it is the only way to judge a book without reading it in its entirety, so why not? 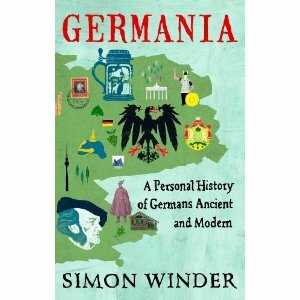 Germania is an apt title for Winder’s project, not because the province of the Roman empire bears much of a resemblance to the place we know nowadays, but because Roman senator Tacitus’s book of the same name has managed to fire up the German historical imagination like few others. A polemic rather than straightforward reportage, Tacitus’s Germania contrasted the decadence of the imperial capital with the simplicity of the savages from the provinces, conjuring up a people who were more geographically and ethnically unified than they had ever been in real life. Ever since, German nationalists have scrambled back to Tacitus’s text whenever the fever of nationalism has seized the country. 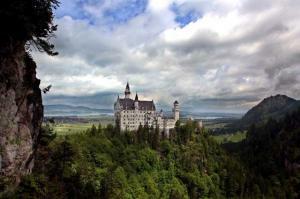 For all his adult life, Winder has been traversing and re-traversing the towns and castlescapes of the German lands. He has visited dungeons, cabinets of curiosities, beer halls, and model-train museums. He has clambered up towers and down into crypts. He has scrutinised suits of armour, paintings, garden gnomes, cathedrals and museums of marzipan. And all the while he has been reading his way deeper and deeper into German history. Out of all this he has spun an enthralling weave of travelogue, anecdote and historical mock-epic. A helpless fan of small-town museums, bad civic paintings, and similar oddities, Winder can’t stop sharing his finds with us. These include some real marvels, like the poorly preserved horse of Sweden’s King Gustavus Adolphus on display in Ingolstadt almost 400 years after it was shot out from under him at the battle of Lutzen. Just as characteristically, Winder’s evocation of the Thirty Years’ War — during which Gustavus’s invasion of Germany saved the Protestant side from disaster — appealingly blends historical knowledge and imaginative empathy for the traumatized lives people led in the war’s “terrible theater of helplessness.” He isn’t all laughs and curios by any means. Many a theme is introduced with a regretful nod to the Third Reich, or bid farewell with a wave heavy with premonitions of Nazism. From the very beginning (both of the book and German history) poor old Tacitus’s use of the phrase ‘pure blood’ is described as ‘catastrophic’ (despite it taking more than a millennium and a half for it to seem so). The Nazis appear fairly regularly, very distractingly and seemingly inevitably – rather like Monty Python’s Spanish Inquisition. However, the rise of Nazism is constantly avoided and militarism is never treated with anything more than a nod; Winder is no apologist, but by his very avoidance of such issues, the silence becomes even more deafening. Why try to present a more balanced view of the sweep of greater German history if you roundly ignore a key element? Why stop at 1933?The answer appears to be that Winder wishes to remove the ‘mental quarantining’ of German history caused by the deeds of Hitler and the Nazis. In that case, his approach is somewhat justified. I still feel he has missed an opportunity by choosing this path. By turns Germania reads like detailed narrative history, a series of impressionistic essays on cultural and historical themes, and personal travelogue. Some may find this pleasingly eclectic; others might find it combines to produce a book that’s a little too long, a bit uneven and with a tendency to ramble. In any event, it’s an entertaining read, full of interesting facts and insights – even if one feels an opportunity has been missed.